How often do you get headaches and neck pain after working with screens? Imagine the effect on your business when that happens to most of your staff! Pain has been associated with increased absenteeism, presenteeism, and staff turnover, and decreased productivity and customer service, which makes sense. It’s hard to be focused and happy when you are experiencing pain. Are you a Manager, Team Leader, or Workplace Health and Safety Officer? Then this series of blogs is designed specifically for you! These Beyond Ergo posts share the new health, safety and wellness skills needed for our unique 21st Century workforce. 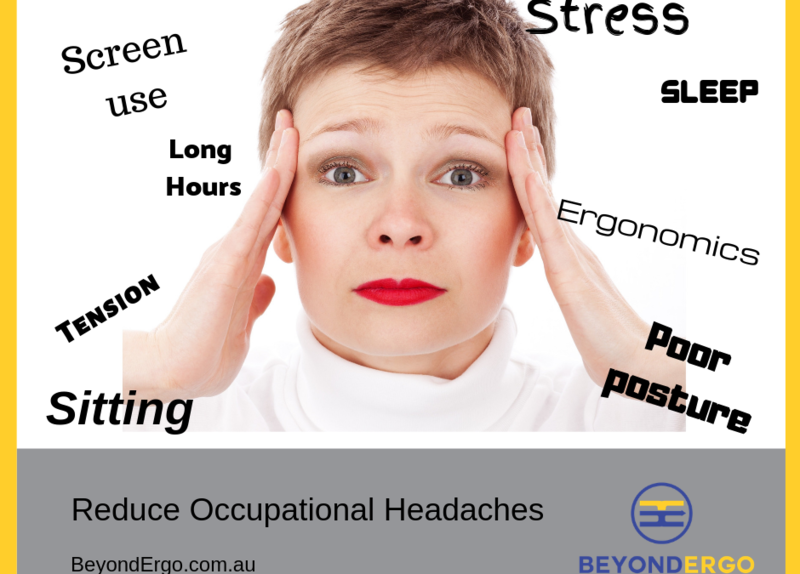 This first in a series of blogs focuses on simple behavioural changes that will reduce neck pain and headaches, especially tension headaches. Other topics in the series include micro-breaks, upper back pain, shoulder pain and finally, the importance of and how to achieve good work posture. All these blogs are accompanied by quick info sheets to download and share. Long hours looking at screens is probably the most common cause of neck pain and headaches. Time flies when you are focused or working on a deadline. Holding static and often awkward postures cause our neck, shoulder and eye muscles to become fatigued. Even changing positions does not give your muscles the recovery time needed to avoid discomfort and possibly an injury. Then going home to extended time on laptops, tablets and mobile phones only make it worse. 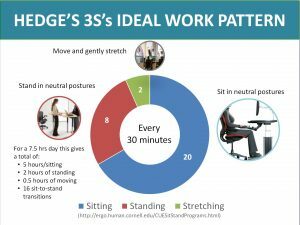 Find ways to incorporate Prof Hedge’s 20:8:2 rule at work. Even if you don’t use a standing desk, the 8 min could be time on the phone, reading from the screen or walking over to talk to a college instead of sending an email. Just as importantly, make sure you have extended time away from all screens while at home. Let your muscle relax and recover from all continuous small movements and static postures that lead to overuse injuries like RSI, frozen shoulders, or Carpel Tunnel Syndrome. When you experience mental or physical stress, your muscles tighten up and become painful. This can increase the feeling of anxiety, affect your sleep and mood and decrease your desire to exercise. Being active is crucial for your mental and physical health. Aerobic exercise releases tension, floods your muscles with oxygen and nutrients, and help remove the waste products that can make muscles sore. Stress can be caused by anything from working at a high pace or the need to appear happy to customers when you don’t feel that way, to issues occurring outside of work. While it’s not always possible to block issues causing stress from your mind, it is possible to relieve some of the physical symptoms of stress. This will also help you feel less stressed or anxious. 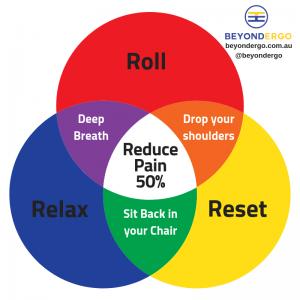 Click Here – To download the Roll-Reset-Relax poster. Think about the effect of continually looking at screens and mobile phones on our posture. The forward neck posture once associated with ageing is now common. In fact, “children as young as 15 have shown posture related early arthritic changes on x-rays” — not a good look and very hard on your body. Maintaining good posture is crucial. As soon as you start to stoop, your body is out of alignment causing all kinds of stresses and strains that can lead to pain and injury. You also begin to feel old, and that is not good for your mental health. You even start to look frail which makes us vulnerable to verbal or physical abuse. That’s not good for our safety! We need to look and stay strong and to do this, it is essential you check your working, standing or walking in a balanced posture. Strive to have your ear over your shoulder and your shoulder over your hip. Try this while sitting down. You might feel a stretch across your shoulders and chest. Make this a habit when you are reading from your screen, waiting for your coffee, or just waiting! Keeping your body in alignment and practising this stretch will help reduce stress on your body that can lead to neck pain and tension headaches. Don’t Let Yourselves Look Old! Constant screen use is now unavoidable and has led to increasing levels of neck pain and headaches. There are four interventions commonly recommended to help protect yourself from neck pain and headaches; ergonomics, stretching and breaks, regular aerobic exercise, and strengthening exercises for the neck and shoulders. This blog series and associated handouts show the easy no-cost changes that help increase staff comfort, decrease pain and absenteeism, and support your workplace wellness program. Click Here to download the illustrated flyer or add your contact details if you would like to receive other information and handouts in this series. I hope you find these simple changes useful. Please share this blog and tell us other health and wellness topics you would like covered or ways we improve the usability of these handouts. P.S. Whenever you’re ready… here are 3 easy ways to find out how this 21st Century training builds skills that increase productivity and staff health and decrease labour costs. Book an obligation free discovery call. Discover how this unique PhD backed training, specifically designed to meet the needs of our unique 21st Century workforce, can be customised to meet your needs and budget. Click Here to book a 30 min complimentary discovery call.